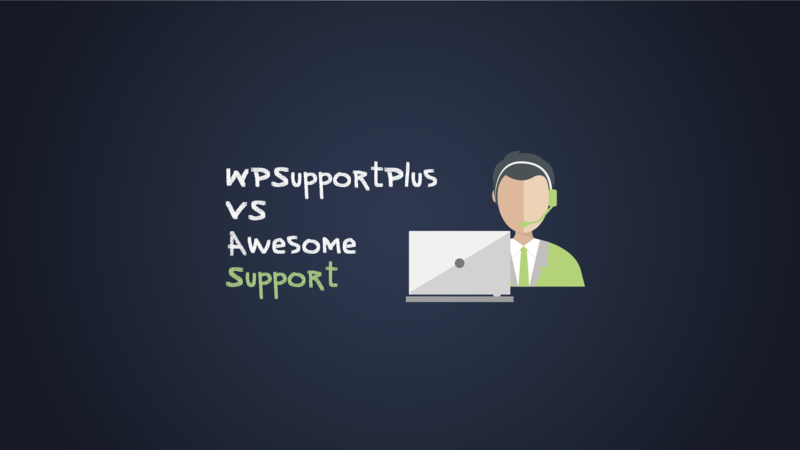 Struggling to choose between WP Support Plus vs Awesome Support? Choosing a WordPress helpdesk plugin is a tricky decision because so many of the important features aren’t immediately apparent on a simple bullet list. Sure - you can find plenty of helpdesk plugins that support “email piping”, but there might be huge differences in how that functionality works in the real world. And those differences will likely have a big effect on how effective and productive your helpdesk is. If you want to be confident in your decision, you need to dig beneath the marketing bullet points and look at things in more depth. To help you do just that, we decided to dig into WP Support Plus and Awesome Support to try to illuminate the deeper functionality contained in each plugin. So, by the end of this article you should know if either plugin can offer the important, productivity-boosting features that you need to run a successful helpdesk. Please note: This article covers both plugins with ALL of their add-ons and extensions installed. Not all features mentioned are free. 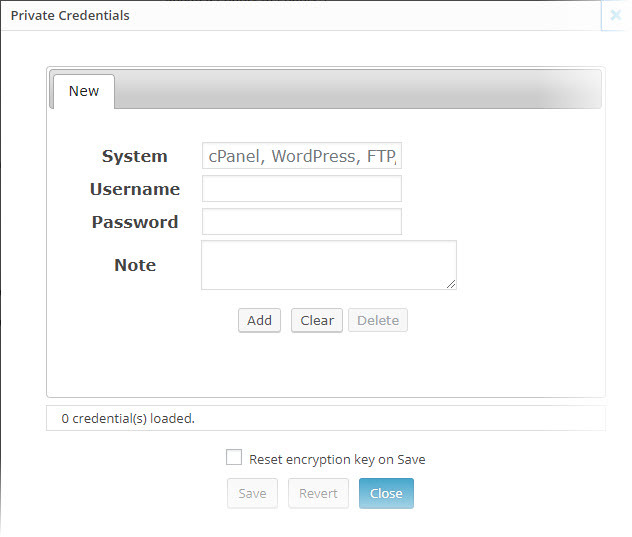 Both WP Support Plus and Awesome Support are free core plugins that can be extended with a variety of premium add-ons. 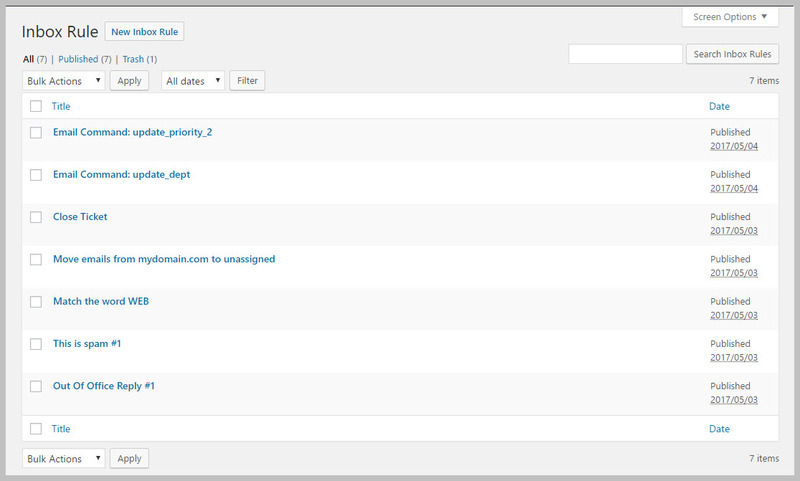 Both are also, by a good margin, the two most popular helpdesk plugins at WordPress.org. That’s for a good reason, too. Both WP Support Plus and Awesome Support offer feature sets with deeper functionality than most other helpdesk plugins you’ll find. But there are some notable differences between how each plugin approaches important areas like ticket assignment, email piping, reporting, and more. In the following sections, we’ll give you a deeper look at how each plugin handles key areas of your helpdesk, as well as some of the notable differences between the two. 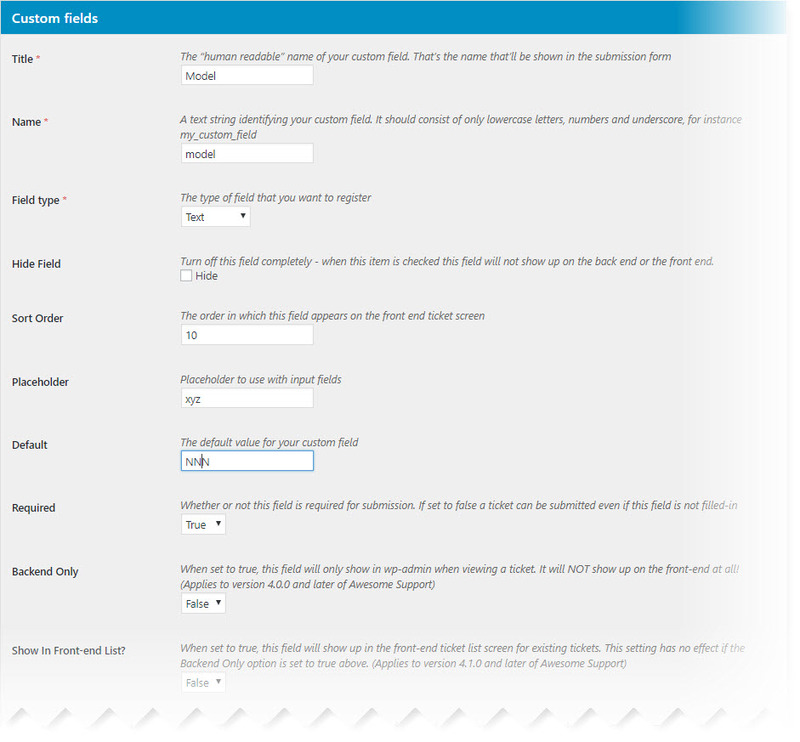 Awesome Support takes things a bit deeper if you want to customize your ticket creation forms, though. You can choose from 11 different custom field types to add custom fields to your ticket creation form, including advanced options like fields for taxonomies and account passwords. Awesome Support Custom Field Definition Screen - There are more options for each field when you scroll down the screen including options for creating rows and columns. And while Awesome Support doesn’t include conditional fields in its default form creator, it integrates with Gravity Forms to help you create forms using any of Gravity Forms’ functions (user registration, Zapier, etc.). Via this integration, you get conditional logic plus a whole lot more. WP Support Plus offers basic routing algorithms that are superior to most other WordPress helpdesk plugins. With one of the premium add-ons, you get access to conditional ticket assignment conditions. With these rules, you can use a series of AND/OR conditions to dictate how tickets are assigned to agents. With that being said, there isn’t any way for you to create smart algorithms that take into account dynamic information like a specific agent’s working hours. As you’ll see in a second, Awesome Support lets you factor this information into your ticket assignment algorithms. 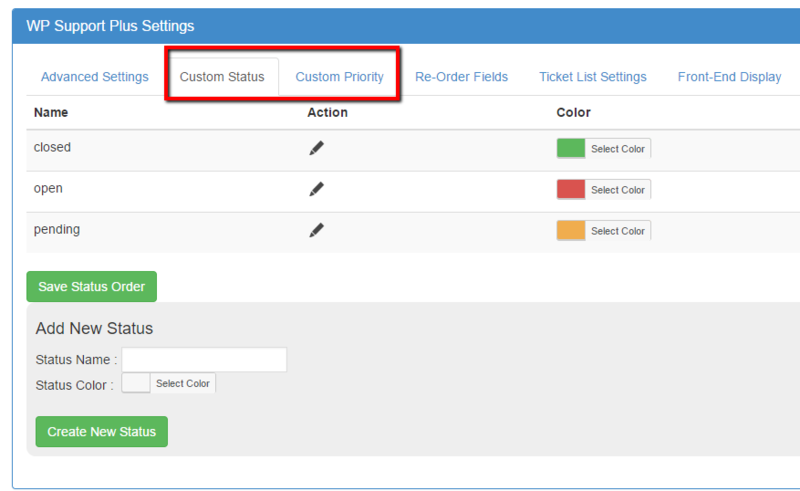 If you need more information in the ticket listing interface, you can also add custom fields as actual display columns. Whereas WP Support Plus gives you basic conditionals to route incoming tickets, Awesome Support sets you up with six different methods that you can use to control how tickets are assigned to agents. 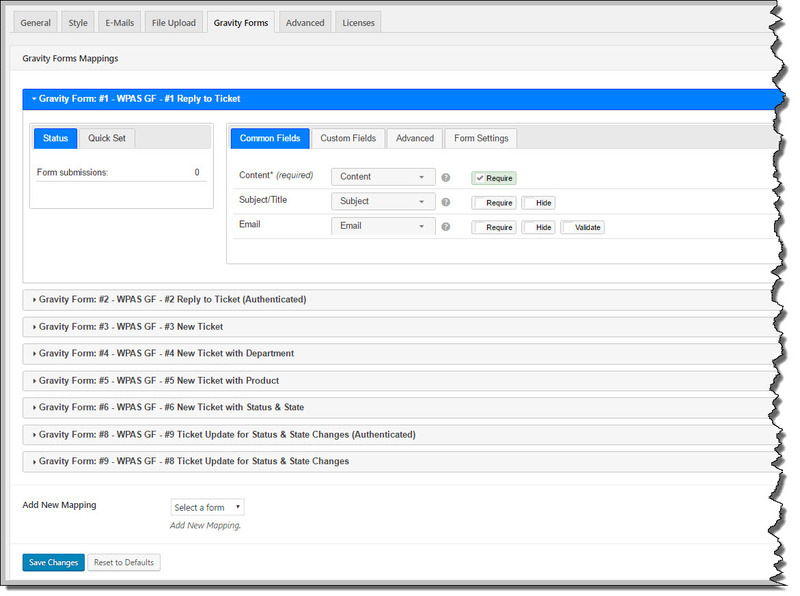 With these algorithms, you can create a truly unique ticket assignment process that fits your business’ needs. And if you like WP Support Plus' approach to AND/OR rules, you'll love that Awesome Support not only matches that functionality, but also gives you a lot more conditions to filter on. Essentially, you can create your “best case” assignment scenario, as well as a fallback to make sure the ticket still gets handled if none of those conditions can be met. Or, you can even let VIP clients pick their preferred support agent, plus lots more. 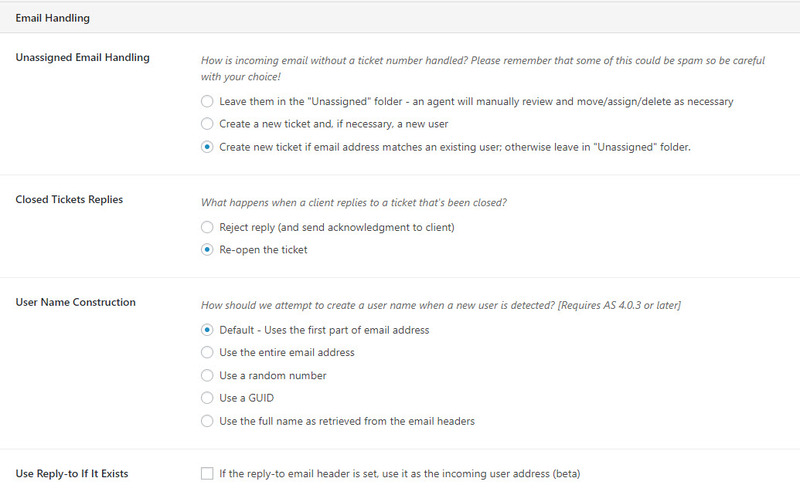 To our knowledge, this is the most detailed ticket assignment feature of any WordPress helpdesk plugin. 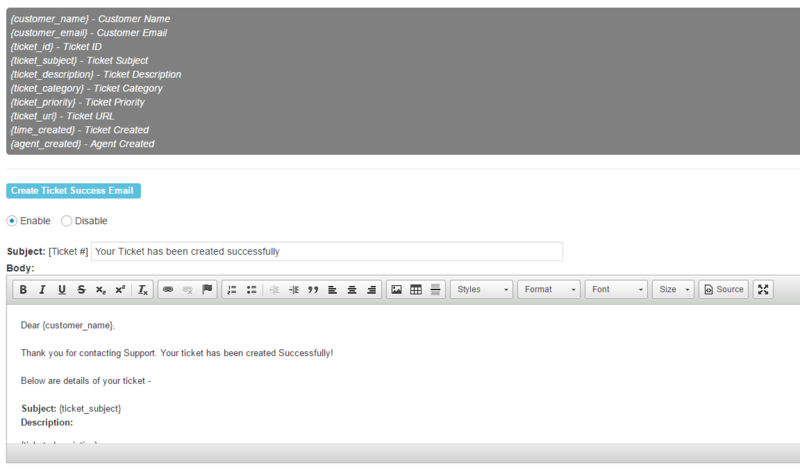 This gives you full control over all the information that displays in the ticket listing screen. Awesome Support's very detailed ticket list. Almost any column can be sorted and filtered on. 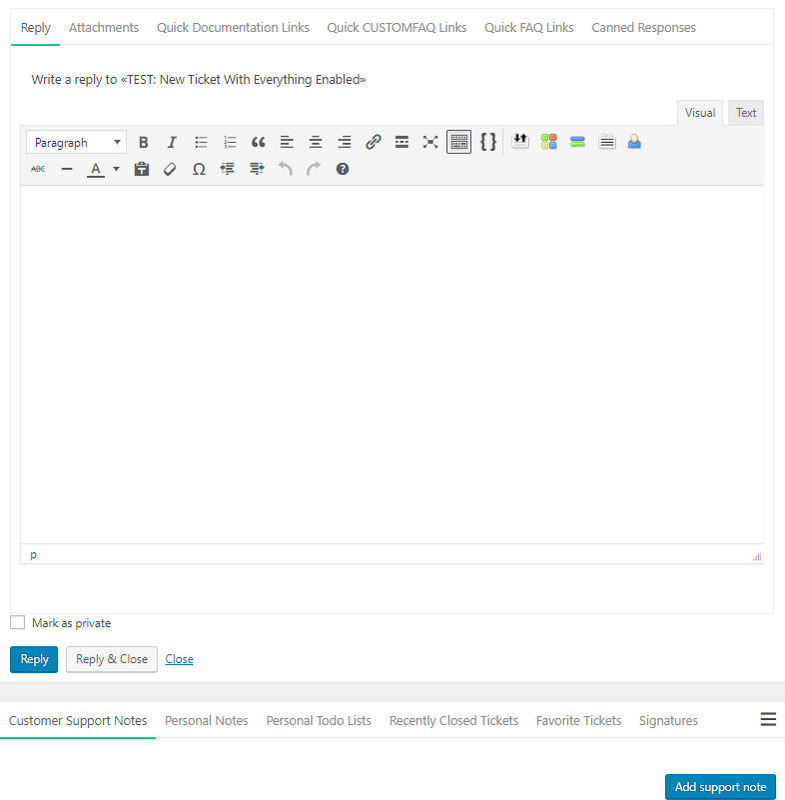 Awesome Support includes the ability to change certain information on multiple tickets in bulk. For example, you can select multiple tickets in the ticket list and change all of their status to a new status. 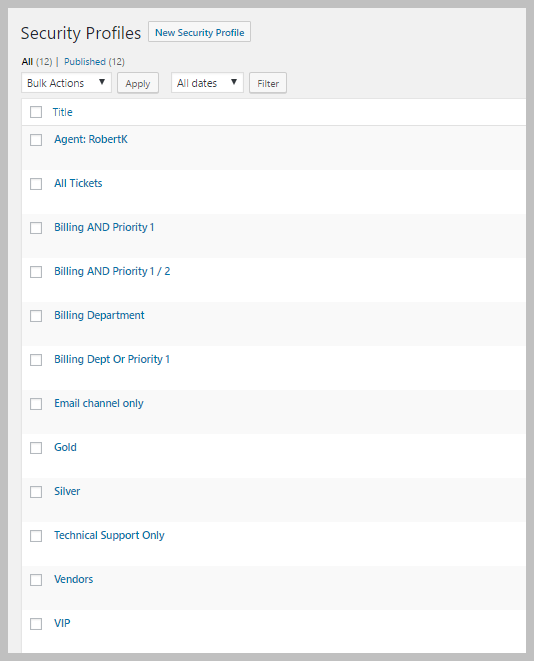 The ability to manage tickets in bulk like this is rare for help-desk plugins. Finally, Awesome Support also includes organization and management features for individual support agents so that they can better do their job. For example, each support agent on your team can create their own to-do list to help keep themselves organized. While both plugins also let you respond to tickets via email, we’re going to save a more detailed discussion of the email functionality for the next section. And we’ll also touch on what happens to inactive tickets. With that being said, while you can close tickets with the “pending” status after a certain number of days, there’s no blanket rule that allows you to close tickets based on inactivity. Changing ticket status, product, department, etc. But Awesome Support builds on these features with some helpful productivity boosts that WP Support Plus doesn’t offer. Both WP Support Plus and Awesome Support let you create and insert canned replies. But Awesome Support takes things one step further by letting you insert template tags into your canned responses to dynamically insert information. Awesome Support also includes another unique feature that lets you split or merge tickets. 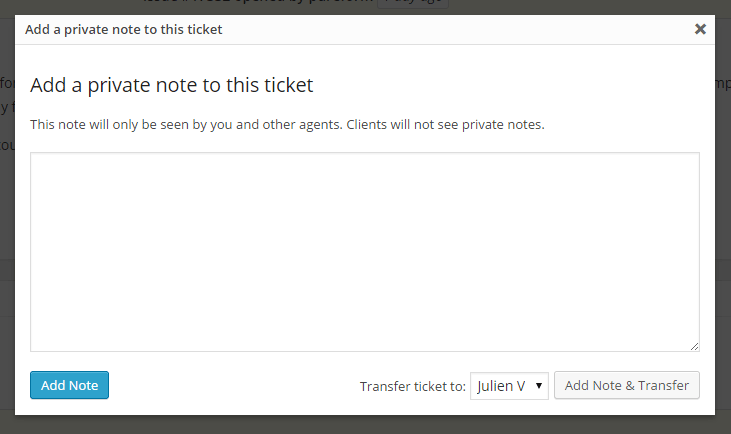 With this feature, you can split a complicated ticket into multiple parts to deal with it more easily. And you can also do the opposite and merge duplicate issues together to keep things organized. 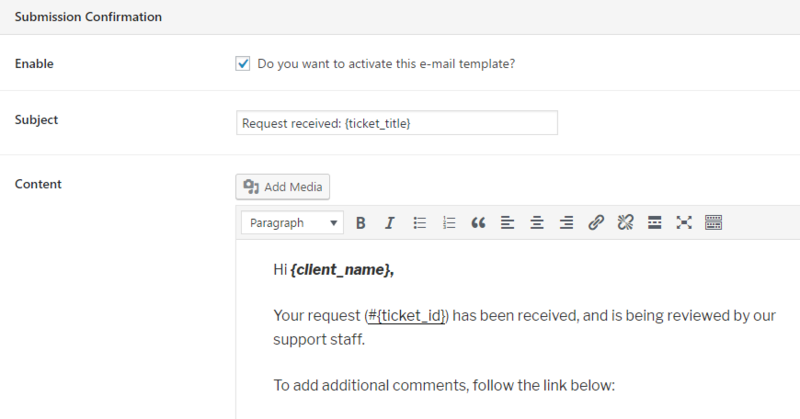 Finally, Awesome Support can also help you automatically close inactive tickets based on a specific time frame, including an option to send out a series of warning emails before actually closing the ticket. While you have a good amount of control over those templates, there’s no option to add new email templates based on custom fields or statuses, which can potentially be limiting depending on your needs. The email is registered at your site. You can, for example, create a new user account for emails from unregistered users. The ticket is closed or not. You can either reject emails on closed tickets or automatically re-open the ticket. Essentially, if your team needs to work over email instead of the interface, email inbox rules ensure that they don’t miss out on any important functionality. On the email notifications front, Awesome Support also sets you up with 5 different default notification emails that you can customize. But it also takes things further by letting you create your own emails for each custom status that you add. And another helpful feature is the option to set up alert emails for third parties that aren’t directly part of the ticket. This is helpful if you’re supporting organizations where multiple stakeholders need to be involved with the ticket. Finally, on a more niche notification front, Awesome Support doesn’t just limit you to email - you can even notify users and agents about changes via PUSHBULLET, SMS (via twillio) or any other service supported by Zapier, which is helpful if you need to offer urgent support. For many types of products, offering support requires access to sensitive credentials like usernames and passwords. In this section, we’ll compare the options each plugin gives you for securely handling such data. Unfortunately, WP Support Plus doesn’t provide any dedicated functionality for managing sensitive data. Your only option would be to include it as plaintext, which isn’t a secure way of handling data like usernames and passwords. Beyond that special valult, Awesome Support also gives you 30+ custom WordPress Capabilities to control exactly who has access to certain information. By default, Awesome support gives you four different user roles to manage these capabilities. But if you want to create your own access restrictions, you can easily use a free plugin like User Role Editor to create your own user roles based on these additional capabilities. Finally, Awesome Support also has a dedicated Security Profiles feature that gives you even more control over exactly which tickets different agents can see. 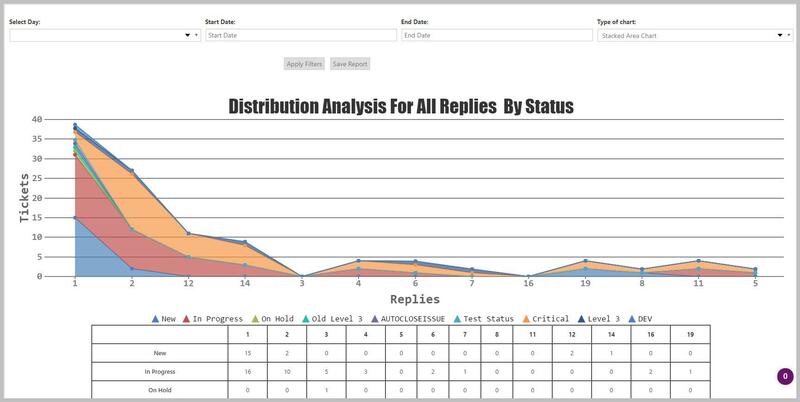 In this section, we’ll look at the reporting options you have for analyzing your helpdesk. 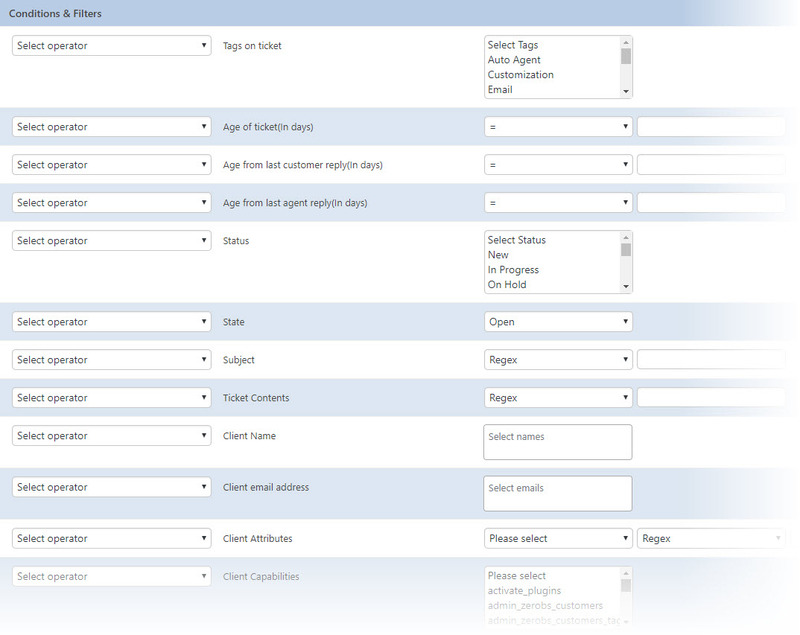 Awesome Support offers significantly more detailed reporting options that you can access in a few different ways. 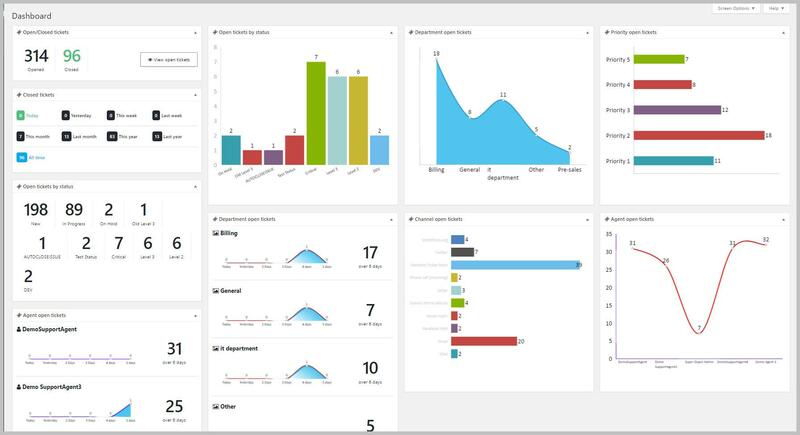 The important thing is that all these reports contain actionable data that you can actually use to analyze and improve your help-desk. 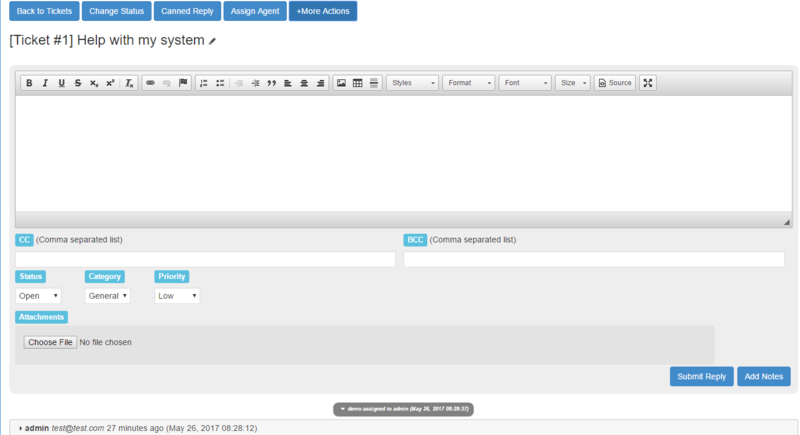 With the six core reports you can create hundreds of different report variations because of extensive filtering options. And you can save and recall these reports as well as assign security options that control who can view them. Company Profiles - these let you assign multiple users to a single company profile so that they can all access that company’s tickets. eCommerce Support - dedicated add-ons for both WooCommerce and Easy Digital Downloads. Timer - agents can track the time they spend on each ticket, which can help to boost productivity. eCommerce Support - integrations for WooCommerce, Easy Digital Downloads, and Envato, including an option to restrict tickets to only users with an active product license. Service Level Agreements - specialized functions that allow you to create and track due-dates that take into account weekends, holidays, work hours and more. Issue Tracking - specialized options for handling many tickets related to the same issue simultaneously (useful for bug tracking, product recalls and more). Ticket Limits - if needed, you can limit the number of active and total tickets a user can have to prevent them from abusing free support. Satisfaction Surveys - 4 different types of surveys to get quantitative and qualitative feedback on your support quality. Slack Notifications - get notifications via Slack when a new ticket comes in. Time Tracking - deep time tracking functionality, including an option for handling billable hours. Public Tickets - create a searchable public archive of your tickets as another self-help option for users - which will help reduce the support load on your agents. FAQs - turn any ticket into a FAQ answer to prevent support requests in the first place. Documentation - Create a beautiful documentation template that allow for consistent presentation across multiple products and includes support for chapters, versions, sections and more. Smart Replies - use smart searches and artificial intelligence technologies to render automated replies via email, Facebook chat bots and your own website chat. Additionally, Awesome Support seems to use more of the WordPress core features such as metaboxes and the WordPress standard custom post type user interface instead of overriding them. This might make it easier for some users to pick-up and reduce overall training time. The core WP Support Plus plugin is available for free at WordPress.org. But if you want access to many of the features that we’ve discussed in this comparison, you’ll need at least some of the premium extensions. To access those extensions, prices start at $49 for a single site license and go up from there. The core Awesome Support plugin is also available for free at WordPress.org. For access to the more advanced features, you can buy individual extensions, as well as multiple pre-built bundles. Individual plugins start at 19.00 but the truly useful ones average around 49.00. 1 = below average depth of functionality. An overall score of 11-21 means below average functionality. 2 = average depth of functionality. An overall score of 22 means average functionality. 3 = above average depth of functionality. An overall score of 23-33 means above average functionality. As you can see, both plugins offer above-average functionality, which is why both plugins are market leaders in the WordPress space. If you’re interested in seeing how these deeper features play out in real life, we invite you to use our fully-featured Awesome Support demo to see everything for yourself.